The Spanish Civil War was sung to me long before I knew what it was about. I grew up in the 1960s. When my parents would invite friends over for a dinner party, the conversations inevitably turned to the war in Vietnam. After dinner, my father, folk singer Tom Glazer, would get out his guitar and play. Often, someone would ask him to perform songs from another very different war, the Spanish conflict of the 1930s. “Do the one about the four generals” was a common request. “Los cuatro generales, los cuatro generales . . .,” my father would sing, and a reverent hush would fall over the room. Eyes would close; people would hum or sing along. This music created an emotional atmosphere I could neither fathom nor ignore. Years later, the songs led me to the history. I found out who the four generals were, the nature of their betrayal of the Spanish people, and why, a few verses later, the song called for their hanging on Christmas Eve. I also came to understand why this music had such an effect; why it was, and remains, important. Peter Glazer and Pete Seeger in 2010. Photo Richard Bermack. Now, thanks to Smithsonian Folkways Recordings, these songs that have inspired generations of activists will be available in a new, beautifully produced, fully annotated, elegant CD package, and the cherished vinyl sitting on your shelves will be augmented by a CD that will last for many years to come. 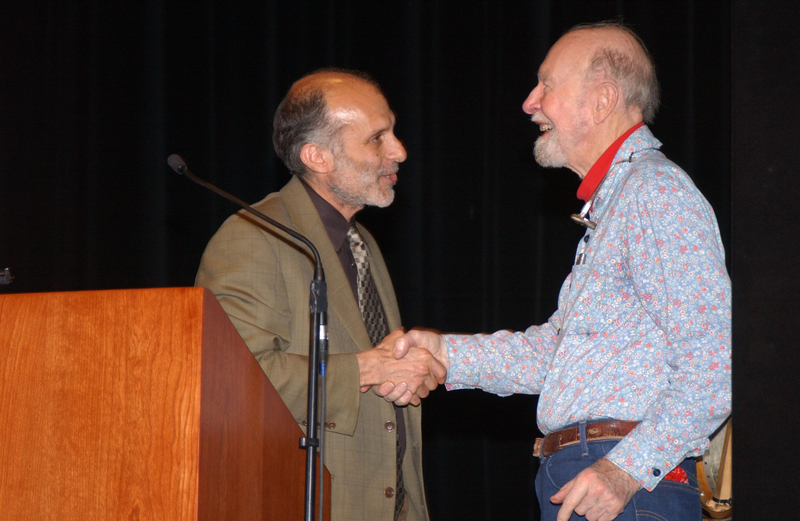 Six years ago, I had the opportunity to spend a month at the Smithsonian Center for Folklife and Cultural Heritage, and got to know Smithsonian Folkways Director Dan Sheehy and Associate Director Atesh Sonneborn. They told me that of all the on-demand CDs they sell to the public, Songs of the Spanish Civil War Volumes 1 and 2 were among their most requested titles. They began to talk about the possibility of re-releasing these recordings in a new set. That project is nearly completed, and will be available this coming October. 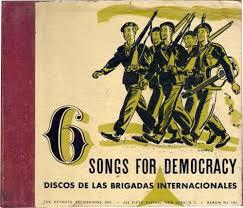 Six Songs for Democracy was originally recorded in Spain in June 1938 during an air raid on Barcelona. One of the records bore a sticker reading: “The defective impression of this record is due to interruptions of electric current during an air raid.” The soloist and organizer of this recording was the great German working-class tenor Ernst Busch, backed by a chorus of members of the Thäelmann Battalion, the war’s German volunteers. It was released in the United States by Keynote Recordings in 1940, to great success. 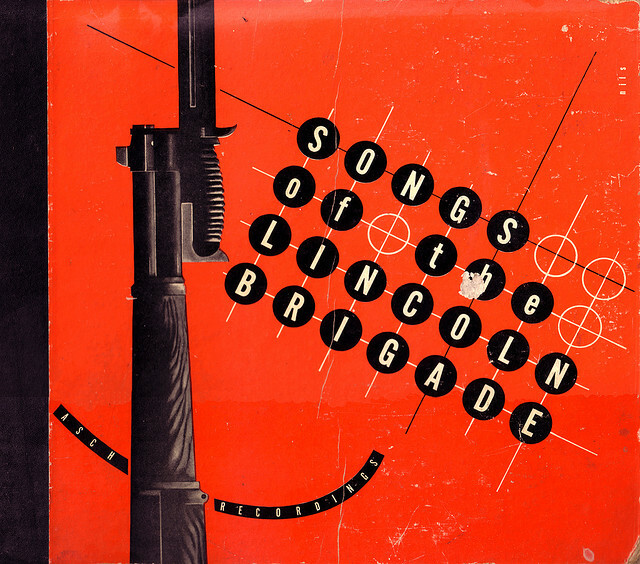 Seeger’s original Songs of the Lincoln Brigade, 1944. Moses Asch believed that an American recording of Spanish Civil War songs could also do well. He contacted Pete Seeger and asked him to put a group together. On furlough from the army one weekend in 1943 or 1944, Seeger gathered fellow folk singers Tom Glazer, Baldwin (Butch) Hawes, and Bess Lomax Hawes to record three 78s. The four singers rehearsed on Saturday and recorded on Sunday. Asch released the tracks as Songs of the Lincoln Brigade. 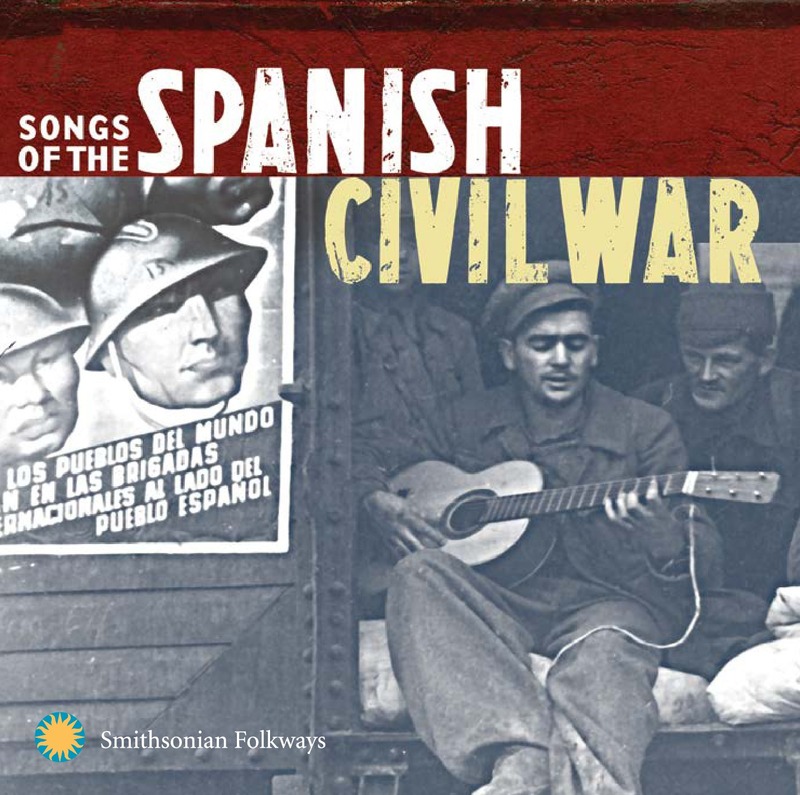 Folkways Records combined the two projects and re-released them together in 1961 as Songs of the Spanish Civil War Volume 1 (FH5436), to mark the 25th anniversary of the start of the war. Part 3 – The third group of songs were excerpts from “Behind the Barbed Wire,” recorded in New York City in 1938 and originally released in the United States by the League of American Writers. Four of the six songs are included here. The title of the collection, a translation of the German song, “Wie Hinterm Draht,” refers to the concentration camps in France, where French, Spanish, Italian, and German anti-Fascists were held and where these songs were sung. 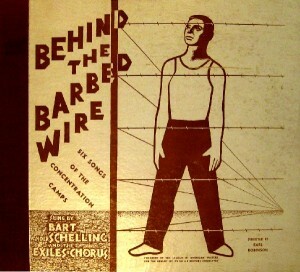 The singer is Bart van der Schelling, backed by the Exiles Chorus directed by American Earl Robinson, one of the leading left wing composers of the era. Van der Schelling was born in Holland in 1892. He was seriously wounded twice in Spain, but continued to fight. He eventually became physically unable to continue, but didn’t stop singing. He was called the official singer for the returning American volunteers. In his poem, “Spain,” W. H. Auden wrote, “Our thoughts have bodies.” Of the 2,750 U.S. volunteers in Spain, one-third lost their lives, but for many of those who returned, the struggle continued. “The war in Spain is over in the field of action,” Republican General Vincente Rojo said in 1939, “but not in the field of thought.” And this “field of thought,” so aptly credited by Rojo, produced its own kind of action on the home front. Among other things, it began and propelled a vigorous commemorative process now 75 years old, in which the musical legacy of the war continues to be a centerpiece. To this day, songs of the Spanish Civil War are sung at annual gatherings in New York City and San Francisco. The songs bring this activist history forward at a time when the causes are no less urgent, and the enemies of freedom no less dangerous. Peter Glazer, ALBA Board member, is the author of Radical Nostalgia: Spanish Civil War Commemoration in America. He teaches performance studies at UC/Berkeley. 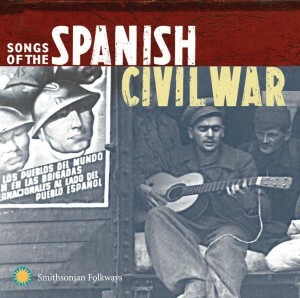 Songs of the Spanish Civil War rekindles the hymnal of the Abraham Lincoln Brigade, honoring the more than 2,600 American volunteers who fought General Francisco Franco and his fellow fascists from Italy and Nazi Germany to defend the popularly elected Spanish Republic during the 1936-1939 conflict. Featuring Pete Seeger, Tom Glazer, Butch and Bess Hawes, Woody Guthrie, Ernst Busch, and Bart van der Schelling, these songs still inspire supporters of democratic causes around the world. Songs of the Spanish Civil War. History books show the big picture, but the songs keep the beliefs, the feelings and the hopes alive. The desire for liberty and freedom has existed for centuries – the spirits of brave people inspired people then and they will continue to inspire us to fight oppression and injustice today, tomorrow and always.